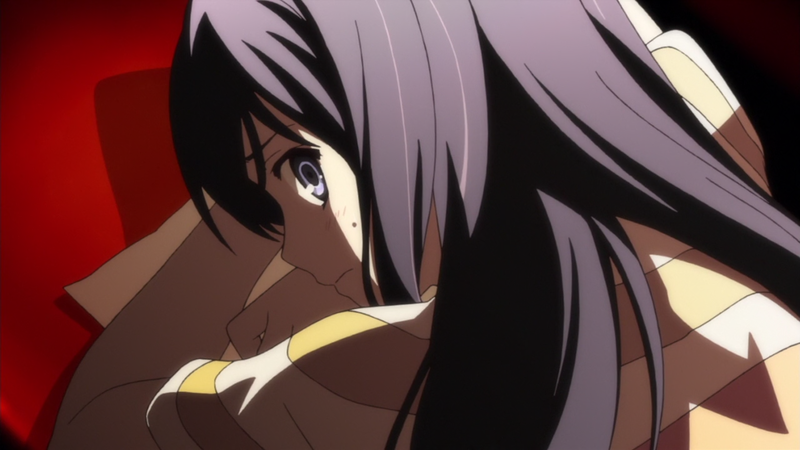 Gokukoku no Brynhildr – 03 | Mezashite! Don’t worry. That red you see isn’t blood. Urgrgh most of my organs are intact but my eyeballs seem to be melting. Baseball was fun though. Invisible Germans were neutral. The big note-wanting thing this episode is the term 鎮死剤 chinshizai. It’s essentially the word 鎮痛剤 (painkiller/analgesic), except with 死 (death) instead of 痛 (pain). “Deathkiller” didn’t sound particularly pleasing, so we went and deathified analgesic instead. Analgesic is an (without) + algesis (sense of pain), so we called the anti-death medicine “athanatics”, from thanatos (death). Because all things medicine-related are Greek. I guess we could’ve done something with the word “death” in it, but I couldn’t pass up the chance to use a word like “athanatic”. Also, the things on their necks are called ハーネスト — “Harnessed”. We call them harnesses, because harness is a noun and harnessed is not. But what if ハーネスト — = “her nest”? Heh, nice work with the pills. I watched DDY’s first and they called them “death suppressors”, but I’m digging athanatics.